Steven Spielberg, he’s probably the most recognisable name in world cinema. The architect of Jaws, Indiana Jones, Jurassic Park, Close Encounters and E.T., amongst many more, Spielberg was the man who managed to match the worlds of commercial and creative cinema. His success at matching the two spectrums is typified by the fact he’s managed the impressive duality of winning two Oscars for Best Director, Schindler’s List and Saving Private Ryan, and still become the most commercially successful director of all time with his films raking in around $9.246 billion. Despite all his success, it’s not always obvious what makes Spielberg such a brilliant director. Unlike auteurs such as Tarantino, Peckinpah, Godard or Hitchcock, whose distinct styles can be spotted within a few minutes of their films, Spielberg’s ownership is a subtler beast. 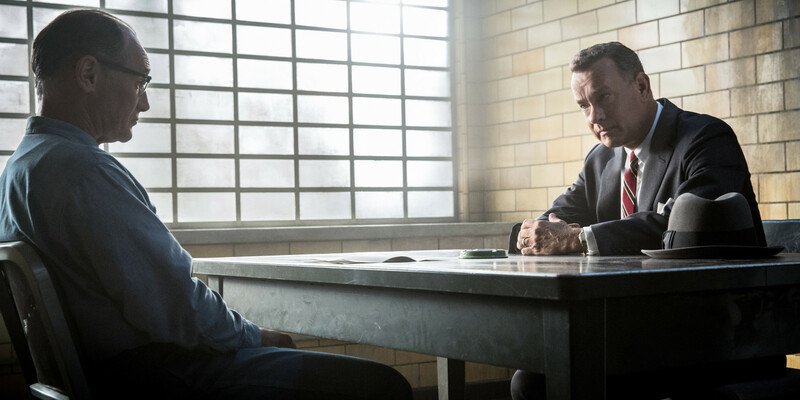 For anyone doubting Spielberg’s powers need only watch his latest release, cold war thriller Bridge of Spies, to see a master craftsman at work behind the camera. 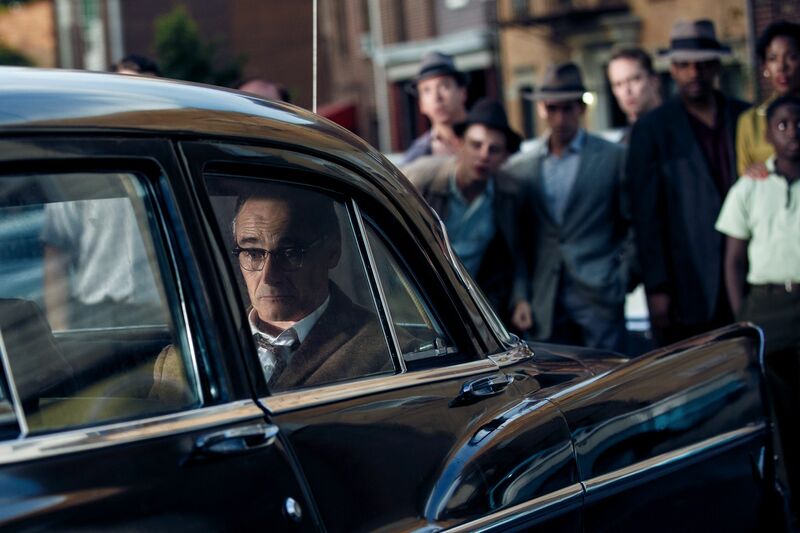 For Spielberg’s latest lesson in filmmaking 101 he’s adapted the true story of how a reluctant American lawyer, James B. Donovan (Tom Hanks), brokered the exchange of captured spies between the USA and the Soviet Union. It’s classic Spielberg material in that it’s the tale of one man’s strength of will, desire and belief in a situation that looks impossible to navigate, in this case the covert world of global espionage. In a superb opening sequence we witness everything Spielberg’s direction is about. The first thing we witness is three portraits of man (Mark Rylance); him, his self-portrait and his reflection in the mirror. It’s a clever nod to the duplicitous nature of espionage; nothing can be taken at face value in the frosty Cold War climate. The subsequent sequence is a long, almost dialogue-less, series of tracking shots following this mysterious man as he travels through the city. As we watch him traverse the bustling streets and subway we begin to notice men tailing him, a couple of 50s suits and fedoras that only standout through their purposeful strides. We don’t know who he or his assailants are, and then the penny drops. After finally reaching his destination, to continue his painting, the man finds a slyly hidden coin under a bench and pockets it. He’s no painter, he’s a spy. It’s a really slick piece of filmmaking that conveys the paranoid atmosphere of the time and sets up the narrative without uttering a word. It’s also indicative of Spielberg’s technical efficiency, there’s never a wasted shot and never a dull scene, everything is superbly orchestrated with seamless guile. It’s, dare I say, near technically faultless. Spielberg utilises every shot in the book; wide tracking shots of the Berlin Wall, panning shots in crowded courtrooms and conversations framed through windows panes. The easy shot is never taken and Spielberg always finds a clever way to show even the most mundane of moments. The understated artistry of the direction can be seen a moment of paranoia on the train where Hanks, the traitorous defender of a Russian spy, is glared at by the rest of the train carriage as his face adorns the day’s newspaper. The camera sits over the judging passengers’ shoulders, confining Hanks to a claustrophobic corner of the screen, all the tide of public opinion against him. It brilliantly captures the essence of the scene without any exposition, the image does all the talking. Spielberg’s long standing cinematographer Janusz Kaminski works the camera in recognisable fashion to supplement his direction. There’s a pristine gloss over the film meaning characters are illuminated by a soft white radiance and a smooth finish appears over everyone and everything. There seems to be a clear attempt to harken back to the classic Hollywood style for the film. It’s never more obvious then when the many indoor shots intentionally resemble a set with the outside world replaced by a vague glow of light from the windows. Superficially it appears jarring, but it gives the period of the 1950s a nostalgic aura that feels both indicative of the time and indicative of the style of films being made in that period. Just as the camera work is in assured hands, so is the script. Joel and Ethan Cohen, along with Matt Charman, gather their immense experience to lend the script a sense of weight and finesse. The Cohen brothers step away from their usual brand of bizarre black humour to craft a script fit for the rather straight narrative. It’s a dialogue heavy film, but the Cohen brothers’ script is fluid and punchy enough to avoid the film lapsing into a turgid didactic slog. The only real weakness is the absence of any true grit or sense of grave danger. The Cold War period is awash with intangible threat and that’s all the film offers us, seldom do we ever feel Hanks’ life is actually at risk. Without ever believing that this delicate assignment could go terribly wrong the emotional involvement isn’t as strong as it could be. Just as Spielberg and the Cohens are well in control behind the camera, so are Hanks and Rylance in front of it. Hanks delivers like always, he may be grey and plumper than he used to be, but his talent for natural conversation is eternal. He’s carved his own niche as the affable everyman who’s morally straight and unwaveringly decent. 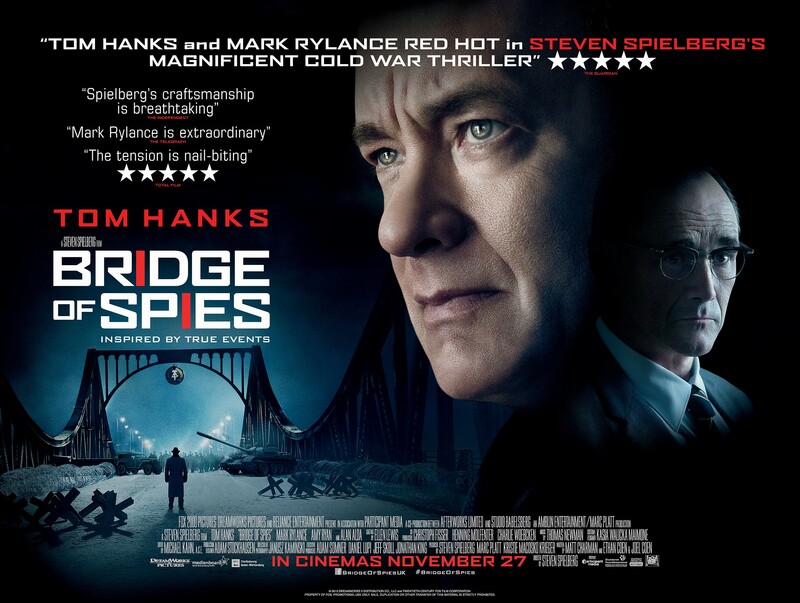 As Russian spy Abel says, Hanks is ‘Stoikiy muzhik’ –the standing man who never backs down. There aren’t many actors who can pull off such a noble character and not portray him as a nauseating do-gooder, but Hanks is one of the few who not only can, but does so with absolute ease. There are lots of good performances in the film, largely down to the script’s studious work, but Mark Rylance excels as spy Rudolf Abel. He’s an intriguing paradox of identities. He’s accused of being a Russian spy, of which the evidence is fairly damning, but his demeanour is docile, almost childlike at times. He appears confused and vacant, but he’s always observing and understanding, as his constant sketching and drawing attests to. It’s a shame that he gets shunted aside in the second half of the film as he’s an enigma capable of taking up the whole film alone. His muddled British, verging on Russian, accent epitomises his enigmatic draw. 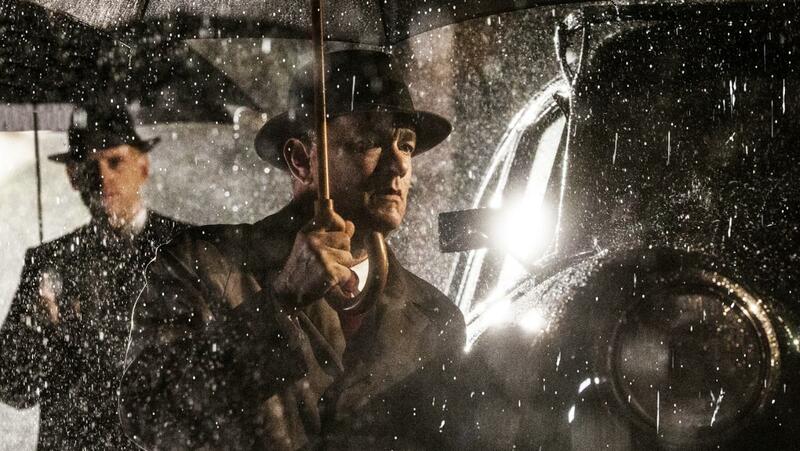 Bridge of Spies is everything you’d expect from Spielberg; familiar, accessible, polished and virtuous. Rarely does it push the boundaries, but nor does it bore you into sly peeks at your watch. With the tried and tested tripartite of Spielberg, Hanks and the Cohens you’re never going to go too far wrong. Perhaps the level headed excellence at work is too safe at times, often it feels like a film worth studying rather than one to be cherished as a favourite. Saying that, don’t be surprised if Spielberg walks out of next year’s Oscars clutching a brand new little gold man to display on his mantel piece.